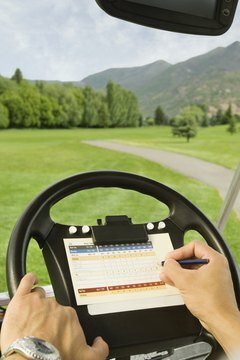 Some golfers factor in their handicap when marking down their score. A golfer's handicap is a measure of how he plays, on average, per round. Casual golfers might not establish handicaps, but handicaps are required for most amateur tournaments and are useful to set fair matches. A "low" handicap is relative, depending on the level of golfers with whom you typically play and quality of players at your club. In most cases, a low golf handicap is one that is a single digit. In other words, it is a handicap of between 1 and 9. Different people may have different definitions of a low handicap. For example, a golfer with a handicap of 2 might not feel that 9 is considered low. Still, anyone with a single-digit handicap is a skilled golfer. If a golfer has a handicap between 10 and 18, she is a skilled player with a moderate handicap. Basically, a handicap of 10 means the player consistently shoots 10 strokes higher than the difficulty rating of the courses she plays regularly. Someone with a handicap of 18 is sometimes called a "bogey golfer," meaning she averages a bogey, or one shot above par, per hole. A high handicap is anything above 18, but even a high handicap can indicate you are an okay golfer. According to the Golf Channel, the average score for all U.S. golfers is 100. This number takes into account many golfers who play only occasionally. Many golfers with low handicaps hope to be able to one day call themselves "scratch" golfers. Use of this term means the golfer is capable of shooting par or better on a consistent basis. A golfer's handicap is directly related to the difficulty, or slope, of the courses where he plays the most. For example, someone with a handicap of 10 who plays an easy, municipal course could not reasonably expect to shoot 10 strokes over par at a challenging course such as St. Andrews in Scotland.